Manitou Springs  is a small resort town just west of Colorado Springs, Colorado. It was founded as a tourist destination and also became known for its mineral springs. But its greatest claim to fame is being the gateway to Pikes Peak. Since the 1970s Manitou Springs has become known as an artist's colony, although tourism is still a very important part of Manitou's atmosphere. It is directly at the base of Pikes Peak and surrounded by mountains (including Pike National Forest) on three sides. Manitou Springs is located about 4 miles west of Colorado Springs by way of U.S. Highway 24. The Colorado Springs Airport (IATA: COS)  is served by eight airlines. From downtown Colorado Springs or I-25, take U.S. Highway 24 west, and take the Manitou Springs exit. Or go west on Colorado Avenue (24 business) and you'll drive right through the center of Manitou Springs. There is daily bus service from downtown Colorado Springs. Manitou Springs is a great town for a walking or bicycle tour. Nearly all of the shops, galleries, bars and restaurants are on or just off the main street, which is Manitou Avenue. Stop by the Chamber of Commerce at the east end of town (Manitou Avenue and Mayfair) to pick up walking tour maps. Cliff Dwellings Museum - In the early 1900s these ruins were moved from southwestern Colorado to their current location. Iron Springs Melodrama Dinner Theatre - Cheer the hero! Boo the villain! Audience participation is always encouraged as families enjoy musical comedy melodrama, sing-along and comedy revue. Mineral Springs - Manitou Springs, unlike Colorado Springs, actually has springs! There are seven mineral springs throughout town where the drinking water runs freely throughout most of the year and is free to the public. Each spring has an interesting history and unique mineral composition and flavor. Pick up sampling cups at the Chamber of Commerce (Manitou Ave. & Mayfair) as well as a map  for a refreshing self-guided tour. Miramont Castle - Circa 1895, this restored private home showcases nine styles of architecture and includes an extensive Miniature Museum. Hike the Incline - 1 mile of stairs (one way) climbing nearly 2,000 feet . Hiking the trail is now completely legal though parking near the trail head may be difficult. Shopping - a wide range of stores including clothing boutiques, candy shops, antique stores, Indian jewelry and unique shops such as the Hemp Store & organic grocery store. Historic Walking Tours - Guided tours of downtown Manitou Springs highlight history, mineral springs. Support Manitou Springs Heritage Center. Pikes Peak, looking to the west. Pikes Peak,  is a nearby mountain. Dubbed America's Mountain, it's not for the faint-of-heart - the mountain's summit is just over 14,000 feet (4302 m). There are three ways to reach the summit: drive , ride the cog railway , or hike via the 12.6 mile long Barr Trail. Driving costs $10/adult with quantity discounts, though the high altitude can be quite punishing on a car. However, it gets much quieter between trips of cog rail tourists. Driving also gives plenty of opportunities to stop to admire breathtaking views, taking pictures of marmots and pikas (the local fauna), or using the facilities at any of several stops on the way up. Plus, the Pikes Peak Highway is just fun for people who like to drive! Trips can be spoiled by overheated engines or hot brakes on the verge of failing if the car is driven poorly. Avoid these pitfalls by using the proper gear for ascent/descent. 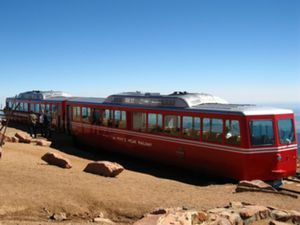 The Pikes Peak Cog Railroad (the cog train to the top of America's Mountain) costs $30/adult, and saves wear and tear on your car. It also allows you to sit back and enjoy the train conductor/tour guide's witty banter and lame puns as he/she explains the sights and points out native plant and animal life. Cog rail allows 30-40 minutes at the peak before descent. Finally, if you are acclimated to the altitude, the hike to the summit is pleasant (but very strenuous) and can be done in a day. The Barr Trail ascends from the east side and is 12.6 miles (20 km) long. You can also arrange to stay at Barr Camp for a night and break up the hike. Take a jacket - it can be quite cool at the 14,110 foot summit of Pikes Peak even in the middle of the summer. Do not consume caffeine or alcohol prior to the trip. The change in altitude is very sudden and stimulants may exacerbate the effects. Drink lots of water... and then drink more. A visit requires several hours to make sure you can sit, relax, eat, drink water, and breathe deeply to avoid altitude sickness. At the top spend plenty of time taking pictures, shopping for souvenirs, and just sitting on the rocks on the northern edge and enjoy the view. In early July every year, there's a "race for the clouds" during which the Pikes Peak Highway is shut down and high-performance cars, trucks, and motorcycles race to the summit, watched by a large and enthusiastic audience. Adams Mountain Cafe - Natural-style foods. Amanda's Fonda - A world class Mexican Restaurant. Famous margaritas. Common Ground - Mate Factor - Organic sandwiches, coffee, smoothies & mate. Craftwood Inn - Upscale American featuring Colorado game. Mona Lisa's - An upscale fondue restaurant; downstairs is a wine bar and scaled-down fondue plates. Savelli's Pizza - Best pizza in the metro. Uncle Sams Pancake House - Breakfast only. Ancient Mariner - Restaurant/lounge with large stage & frequent music. The Keg - Another local fave restaurant/lounge; good chicken sandwich. Kinfolks - 950 Manitou Ave, (719) 685-4433‎. 8 taps of micro-brew beer. No hard alcohol & no food. The Loop - 965 Manitou Ave, ((719) 685-9344‎. Mexican restaurant with a small bar & famous margaritas. Royal Tavern - 924 Manitou Ave, (719) 685-9916. Biker bar with the cheapest beer. No food & no micro-brews. Small smoking patio. Stage coach Inn - Nice restaurant with a small bar. Good beer & wine selection. The Townhouse - 907 Manitou Ave, (719) 685-1085‎. Restaurant/lounge with large patio, music, pool tables & good food. Pikes Peak Marathon - Mid July. 2-days. World-class runners race up and down Pike's Peak. Craft Lager Festival - August. 2-days. Sample micro-brews from around the country. Emma Crawford Coffin Races - Weekend before Halloween. Thousands of people watch 4-man teams custom coffins on wheels. Accommodations range from small mom-and-pop motels to national chains to the Cliff House, an historic grand hotel recently restored to her former beauty. Refer to the Chamber of Commerce site for a complete listing. As mentioned previously, walking is an excellent way to see Manitou. The town is also close to many great hiking/running/biking trails. Garden of the Gods abuts Manitou on the northwest side and has many hiking trails. Barr Trail is the longest trail, although it is virtually straight up (and down). The Intemann Trail skirts Manitou's south side, running from the Iron Springs (near the Cog Railway)ending at the old cemetery. Red Rock Canyon (on the east side of Manitou) is similar to Garden of the Gods (it is a geological extension with similar sandstone slabs) and has a well-designed trail system that has become quite popular since opening in 2006. Waldo Canyon is a nice loop located about 2 miles west of Manitou along Highway 24. This page was last edited on 2 January 2018, at 20:33.